This delicious little salad comes together in a snap! Yes, summer is winding down and with school starting everybody is gearing up for fall. But it’s still summer, which means there is still a bounty of fresh, lovely tomatoes! 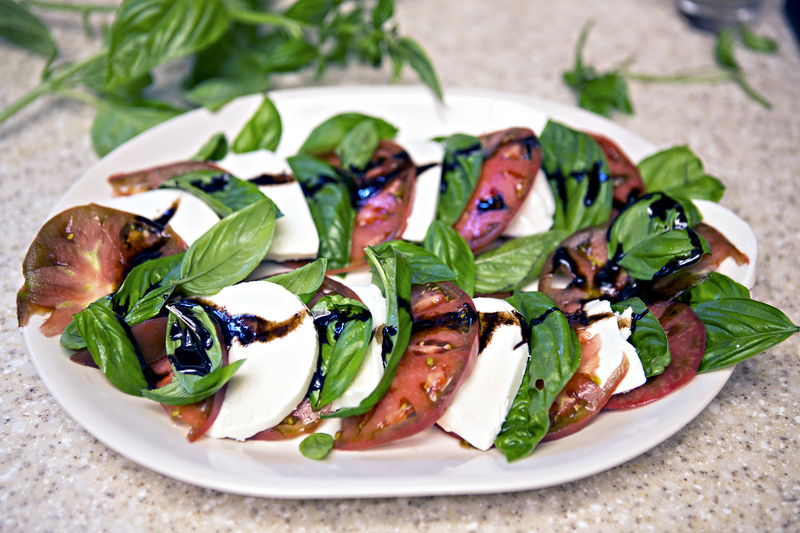 Appreciate this summer veg in one last hurrah by celebrating it in a caprese! This is probably one of the easiest salads to make, and is perfect with summer tomatoes, because tomatoes always seem to taste better in the summertime. Adding the balsamic reduction takes it up a notch without adding much more time. You can have the balsamic simmering as you slice and plate all the other ingredients and everything should be done in about 10 minutes. Do keep in mind that your balsamic will reduce A LOT by the time it’s the right consistency, usually by about 4 times. So 1 cup yields 1/4 cup of reduction, or even a little less. But it’s so worth it! This is also a great way to turn cheap balsamic vinegar into the more expensive stuff that you can never justify spending $30 on for a teeny weeny amount. This caprese is also a great excuse to use some of those fancier ingredients that people give you as a gift because they know you like to cook. Like Fleur de Sel or any other extravagant sea salt, or that expensive infused olive oil that you don’t know what to do with because you’re not “supposed” to cook with fancy olive oil. Whether or not it’s a “special occasion” go ahead and use it! That’s what it’s there for! That and, there is nothing more sad than a bottle of fancy infused olive oil that has gone rancid because you kept saving it for something special that never popped up. You know what’s special? The end of summer. Even though here in Texas “summer” doesn’t really end until October, but I digress. Happy eating! Bring the balsamic vinegar to a boil, then simmer for about 15 minutes until it is reduced to about 1/4 cup. It should be the consistency of syrup. After everything is sliced, arrange the tomato and mozzarella slices and the basil alternating on a platter. Drizzle with olive oil and season with a little salt and pepper. Once the balsmic has finished reducing, let it cool slightly (but not so much it starts to harden) and drizzle over the whole salad. Serve immediately.